Never mind that the KKK was started by Democrats and strung up both blacks and Republicans; Grayson never misses an opportunity to self-inspect his own alimentary canal … from the tail end. Ridicule is man’s most potent weapon. There is no defense. It’s irrational. It’s infuriating. It also works as a key pressure point to force the enemy into concessions … Pick the target, freeze it, personalize it, and polarize it. Cut off the support network and isolate the target from sympathy. Go after people and not institutions; people hurt faster than institutions. 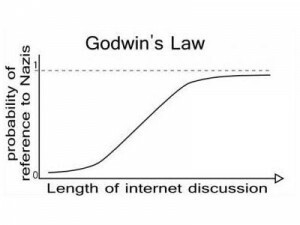 And it’s not only online discussions that prove Godwin’s Law, I remember sitting at lunch with a construction crew when one of the carpenters brought up my work in the pro-life movement. By the time his foot-long Subway Club had been inhaled to the halfway point, he had already dropped the Nazi card. I don’t normally suffer fools but, because of the audience, I decided to play along. “So let me get this straight, you’re implying that I am a Nazi because I believe that a baby in its mother’s womb has an innate right to life? And that a mother, even on a bad hair day, shouldn’t incinerate it with chemicals or have a Mengele like doctor tear her unborn son or daughter apart with forceps, is that right? Me: “Not telling people how to live, in this case, just telling them not to murder, but let me tell you who I am by first telling you who the Nazis were because frankly, your ignorance is downright embarrassing. Adolf Hitler was a vegetarian who banned smoking in all public buildings after his party surreptitiously burned down the Reichstag and cast the blame on their political rivals. When the Nazis annexed the Sudetenland, of the very first laws that were passed were those prohibiting gun ownership and legalizing abortions. As a matter of fact, certain abortions were encouraged. In a purge to separate “Jew and State,” Jews were expelled from the Army, from schools, and eventually from public places. The persecution that ended in ovens was started in the public square by passing laws to tax them, restrict them and identify them. Oh, and one more thing J.D., the Nazis were socialists. You did know that, right? Nazis redefined marriage, encouraged promiscuity, used the power of taxation to suppress political enemies and subverted the press to carry their message. “So tell me again, friend, which side is more reminiscent of the National Socialist German Worker’s Party? The one that booed God and Jerusalem three times from their national convention; the one that hasn’t met a tax, an abortion or an abomination that it doesn’t endorse, celebrate and force on others or the tea party that supports life and liberty, that believes in choice unless it involves a crime to another, that believes that with great sacrifice comes great reward, that will stoop to help others climb up but will refuse to bow and be pilfered? At this point J.D. walked away but on the chance he’s reading this column, here is what I would have said had you stayed to finish your foot-long. “You mean like telling them what they can and can’t eat? Like telling them to trade in the Hummer for the Prius? Like legislating how much water they can flush? How about the government panel that will tell Grandma to take the pill and not have the surgery? Does kicking Christians out of the Air Force while inviting Pandora’s closet in qualify? How about shouting down conservative speakers at Universities and kicking them off panels, stations and shows? How about suing Christian bakers, photographers, and bed and breakfast owners who don’t bow and kiss the rainbow ring? Hitler was Christian. The Nazis persecuted Homosexuals along with Jews. And there is no government panel to prohibit granny’s operation; that us s lie. You might consider getting your facts right before you try to diatribe. Hitler was Christian only in the sense that he had been baptized and raised in the Church, which he abandoned in adulthood. In other words, not really. And, as I understand it, most of the reputable biographers and historians consider him to have been, if anything, anti-Christian. Ridicule and name calling aren’t limited to any party! Libtard, repukeican, demofart, tea bagger, and the list goes on and on getting more offensive as it goes. Too many “Christians” on BOTH sides resort to this level of immaturity.